We anticipate that accommodation will be at a premium for this event; please consider sharing a room with friends, booking a bed in a shared dorm, or bringing a campervan/camping if you're an outdoor type! Not only will you save yourself some cash, but it will mean that more people can join the fun! 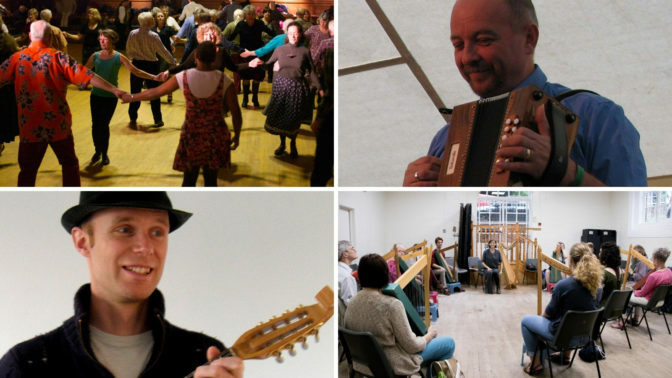 New for 2019, this ‘taster’ weekend offers the opportunity for complete beginners to discover one of the following: folk dance with Jenny Read, folk fiddle with Matt Norman, melodeon with Ed Rennie, or folk harp with Steph West! Spaces on each course are limited, and it’s essential you tell us which course you’re planning to follow when you book. There will also be a ceilidh on the Saturday night led by the tutors, for everyone to enjoy! Folk Dance with Jenny Read: This weekend will be a great opportunity to try your hands (and feet!) at a wide range of traditional dance styles. We will explore the basics of English social dance, giving you confidence in the figures and footwork needed for a ceilidh or barn dance. There will also be a chance to try other styles – longsword, morris, stepdance, maypole, Scottish, American and more – to give a flavour of what else is out there. DG Melodeon with Ed Rennie: Unravel the mysteries of the DG Melodeon, for absolute beginners. Ed has a methodical step-by-step approach to help you get started on the right path. Boxes are available to borrow, or if you have a DG melodeon bring it along. Ed will teach by ear and with music – but don’t panic, you don’t need to know how to read music in advance. Folk Fiddle with Matt Norman: Suitable for those who are picking up a violin for the first time and those who have played a little but want to work on basic technique. There will be an emphasis on playing with good technique but everyone will also come away from the course being able to play some tunes. It’s not necessary to read musical notation but music will be provided. Folk Harp with Steph West: Ever wanted to learn to play the harp? Now’s your chance! Harpist Steph West is here to take you through the basics, learning how to navigate the harp, how to use your hands and have fun with this fascinating instrument. We’ll learn a few tunes and play some pieces together, along with tips and tricks to make the journey fun. This course will be taught by ear, with score available at the end. Please bring a recording device. Harps will be provided. Absolute beginners! You might be a dancer who wants to learn an instrument, or a classical musician who wants the challenge of learning a new folk instrument. Perhaps you’re a musician who wants to try dancing, or an experienced dancer who has never tried folk styles. Or maybe you’ve never danced a step, or played a note, but are dying to give it a go… All are welcome, and you’re never too old to try something new! For each of the music courses, instruments are available to borrow for the weekend (we anticipate there will be an additional fee for harp hire due to the expense of transporting the instruments). You don’t need to be able to read music. For the dance course nothing special is required, just cool, comfortable clothes, plus trainers or comfortable shoes (not slip ons). Bring some hard soled shoes for stepping if you have some. Jenny Read is an experienced folk dancer, musician, teacher and performer based in Devon where she teaches school and community workshops for all ages and abilities. Co-director of Spinningpath Arts CIC, co-author of the Maypole Manual, and 4 times winner of the Dartmoor Stepdance Competition, Jenny loves getting people up and dancing, and discovering that they can do more than they expect! A founder member of the Devon Squeezebox Foundation, Ed Rennie is passionate about helping people get started – and keep going! He has published a number of tutorial books and CDs, runs beginners workshops at venues including Halsway Manor and festivals including Sidmouth Folk Week. For a long time best known as the melodeon player in The Bismarcks, Ed is also a fine singer, and plays bass for the Dartmoor Pixie Band. Matt Norman works with all aspects of traditional English music as a performer and teacher. He is a very experienced workshop leader with a relaxed and friendly style which puts participants at their ease but also gets high quality results. Matt performs in two bands: Gadarene combines 17th and 18th Century English tunes with modern dance beats; The Bristol Ceilidh Quartet plays for social dances. Both bands have performed at folk festivals and events across the UK. Matt is also a solo performer playing mandolin, fiddle and piano, for dance and also on stage. Harper and singer, Steph West works as a performer, teacher and workshop leader. Whilst studying early music at the University of Birmingham Steph fell in love with the clarsach/folk harp. Steph’s main trad styles are English and Irish and she has worked as a performer and teacher with artists and organisations in both fields: EFDSS, Comhaltas Ceoltóirí Eireann, Irish flute/whistle virtuoso Jacquelyn Hynes, Shooting Roots youth folk arts project, Edinburgh International Harp Festival and Guildhall’s CYM. Steph currently plays with her European bal / swing band Midnight Patisserie and her singer-songwriter duo with drummer Paul Radmeyer. Steph is currently working on English trad repertoire for the harp, bringing out a book and courses in 2019. The only harpist with 9.5 fingers, Steph also works within the integrated/disabled arts world. She works as a performer with the British Paraorchestra and RNS Moves. She has also mentored for Open Up Music, who are pioneering the National Open Youth Orchestra.